This is just your periodic reminder that the Tarot of Bones deck does not have a Little White Book in it. The LWB is found in a lot of tarot decks and it includes very basic meanings for the cards. In an attempt to cut down on paper, I opted not to include one. Instead, you can find all the basic card meanings, both upright and reversed, free of charge at http://thetarotofbones.com/the-cards. 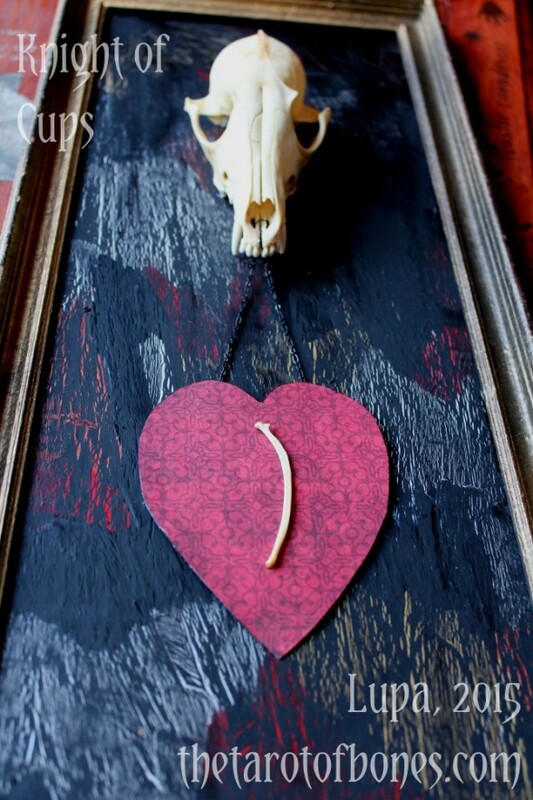 You can also view photos of the original assemblages used in creating the Tarot of Bones. And you can even find out which originals are available for purchase! For all this information, click on the thumbnail for the card you’re looking at. You’ll see the pictures, first, then either a link to where the original is for sale or the statement “Original Assemblage SOLD” if it’s already found a new home. After that are the dimensions and other info about the assemblage, and the basic meanings for the cards. Simple as that! If you decide you want more elaborate interpretations of the cards to study, consider picking up a copy of The Tarot of Bones Companion Book in either paperback or ebook format from the official Tarot of Bones shop at http://www.thetarotofbones.com/shop/. 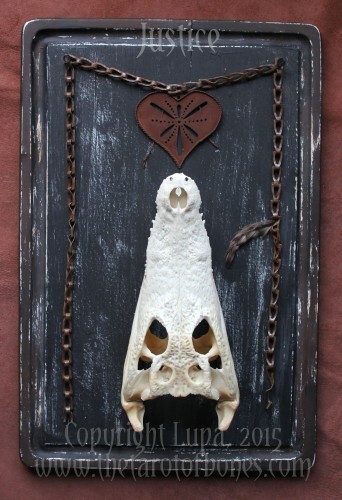 Tarot of Bones Original Assemblages For Sale! So I finally got the rest of the original assemblages listed on line! You can find most of them here on Etsy, but there are a few on my Storenvy instead. Keep in mind that some pieces have sold, so if you don’t see the one you want for sale on either of those shops, it means it’s no longer available. Major Arcana Original Assemblages For Sale! Please note that layaway is available for all of these pieces, so if you can’t pay the entire price all at once I’m willing to work with you! The pieces with replica skulls can be sent internationally; the rest are US only. I’m also happy to combine shipping if you want to pick up a Tarot of Bones deck and/or book. 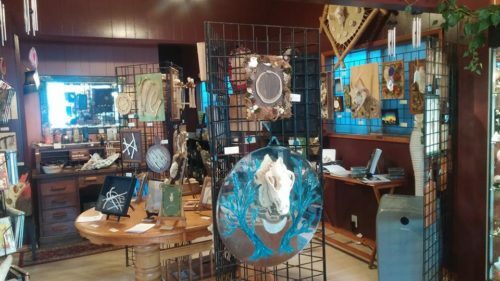 I just wanted to give a big thank you to everyone who came out to the Tarot of Bones Art Exhibit and Workshops weekend before last! It was wonderful to share my work in person with so many people for those two days, and to spend one more time in the presence of all eighty of the original assemblages used to create the deck. I appreciate everyone who enjoyed the art, came to the workshops, and asked questions. 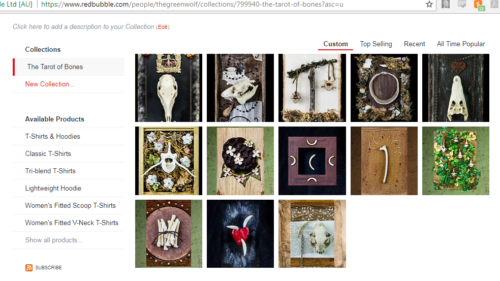 I am also grateful to everyone who bought Tarot of Bones decks and books, and even purchased assemblages! I will be listing the unsold assemblages on my Etsy shop soon; in the meantime, please know that I am ever grateful to the support you all have given me for the past few years as I’ve brought this project forth from idea to fruition. Announcing the One and Only Tarot of Bones Art Exhibition! 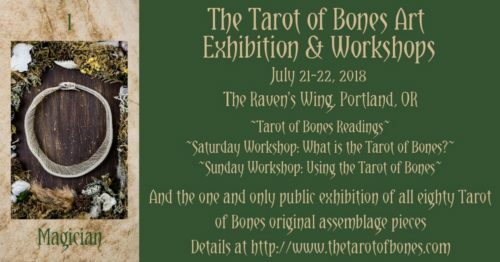 Saturday, July 21 Workshop: What is the Tarot of Bones? What inspired artist and author Lupa to create this uniquely nature-themed divination set? Join us as we learn about the creation of the Tarot of Bones, from concept and design to artistry to self-publishing and more! You’ll learn about the bones and other materials involved, why she chose certain animals and bones for each card, and how she wove messages from nature with traditional tarot symbolism. And you’ll have plenty of time to ask questions, too! Free to the public, time TBA. New Tarot of Bones Designs in My Redbubble Shop! No LWB in the ToB? The information that you would find in a LWB–basic meanings of the cards, both upright and reversed–is already available for free on the website in the Card Art Gallery. 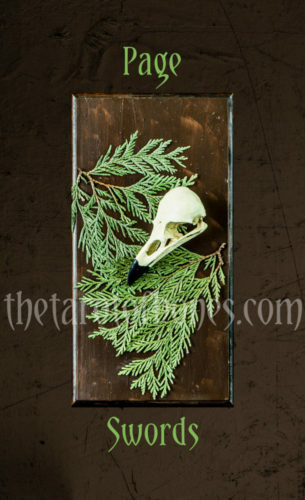 Just click on each individual card (you can narrow things down to the Major Arcana or one of the suits with the menu above the images in the main gallery) and you’ll get several images of the assemblage for that card as well as the final card art, along with information on what materials are included (including species of skulls, etc.) I’ve also included brief upright and reversed meanings. Generally speaking, the species of bones used in the Pips don’t really matter; I just used whatever I had on hand that worked well in the assemblage. For example, I used a deer leg bone in the Ace of Wands, but the fact that it’s deer didn’t really factor into the card’s meaning when I was designing it. Rather, the leg bone was the right size and shape for the assemblage. With some of the Courts and Majors I go into a little more detail on species, as with Temperance here. Additionally, the Daily Draws aren’t just for promotion. They’re also for you to see the cards in action, and how I interpret them. Want to See the Final Card Designs? Hey, folks! Do you want to see the final designs for the Tarot of Bones cards? They’re now available at http://www.thetarotofbones.com/the-cards/ ! Just click on the entry for each card and you’ll get to see both the final design and the original assemblages. Last night I received the last few photos of Tarot of Bones assemblages, and I stayed up much later than I should have completing the layout on the final cards! Woohoo! So now what? I still want to go over the cards one more time–check for any errors and minor adjustments, that sort of thing. Then I’ll resave them in .psd format–I’ve been working with .xcf files in GIMP 2.0 since you can keep editing them even after you’ve closed and reopened them. After that, the files will go to the printer and then it’s just a matter of waiting. In the meantime I’ll be working on the perks from both IndieGoGo campaigns so I can get everything shipped out once the decks and books both arrive. Anyway, the pics turned out spectacularly, as is expected, and all that needs to be done is for her to do post-production on those last few. I should hopefully have them this week, at which point I can sit down and do the layout on the last few cards. After that, I’ll need to go over the files one more time to make sure they’re all flawless (no typos, etc. ), and then re-save the .xcf files to .psd, and get them sent to the printer! I do have vending events coming up the next few weekends, plus I am prepping monthly goodies to send to my Patrons on Patreon in November, plus my birthday is November 1 so I have the day off, so I *might* not make my “end of October” deadline right on the nose, but if it’s not done this week it’ll be done very soon after. I’m too damned close to let this slide now!